Have you ever dreamt of your home's lights to turn on when you approach your house, so you will never walk into your house and be surrounded by darkness? This device aims to do all of that for you, so your lights will be on when you get close to your house using GPS. The lights will remain on when you are inside the house. This project utilises Blynk to operate, Blynk requires mobile data to run on the move, so it must be enabled for this project to work, note that a Blynk account and app is necessary to run this project. This project works fairly simply, Blynk monitors the phone's geolocation and sends the feed to the Arduino Yún. The Arduino Yun compares the phone's geolocation to home's location (Home is set by the user manually). 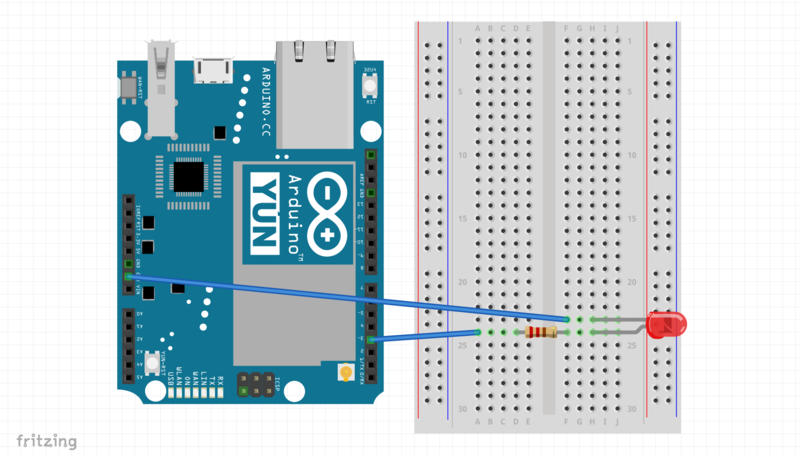 When the phone is detected to be within range of home, the Arduino Yun will turn on the LED. Here is an image illustrating this. The device will constantly monitor the user's phone location, always checking if the user is within home range. Here is an image illustrating the code overview. If(isInParameter will check if the user is within the home's parameter, if it is, the function TurnLEDOn will commence witch will turn the LED on. Else will do the TurnLEDOff statement witch will turn the LED off if the user is not within home's parameter. The Arduino Yun will automatically set home's parameters according to the co-ordinates of home. The Yun will create a square around home, with 4 points in each corner, in this way, if the user is inside the square, the device turns on the LED, if not, the device turns off the LED. The default range for the square is about 60 meters in all directions from the setup point. Here are some images showing the device in action. There are a few things needed in this project, the list of them are below. This project has a physical circuit consisting of an LED and resistor, here is an image of the schematics of the project. The next step is to figure out the geolocation co-ordinates of your house, the images below will illustrate this process. A Blynk account is required to utilise this project, you will need to download the Blynk app from the App Store or Google Play to start off with, now follow the images below to setup Blynk. These sections will be explained below. This section of code reads the geolocation from the Blynk Virtual Pin and stores the values to variables, the debugging section allows you to debug the device by entering a specific location, note that the values read are your phone's co-ordinates. This part of the code checks if the location of the phone is within the parameters set as home, note that a square is automatically formed around the inserted geolocation, and the Arduino checks if the phone is within the square. The simple last part of the code turns on the LED is the user is approaching or is in Home and turns it off if the user is away. There are a few values to set in this project, to get started with enter your Blynk Auth Token received through email in the Blynk Setup step in the auth variable. Then take your Home's geolocation latitude and longitude and insert them in the myLocationLat and myLocationLng variables. The last step is to check if you are debugging, if you are not, considered setting proDebug to 0 to prevent Serial Prints, if you are debugging, you may want the Arduino to receive a fixed geolocation instead of your phone's geolocation, if you go to the BLYNK_WRITE loop there are further instructions there. Bridge - copyright (c) Arduino LLC under the GNU Lesser General Public Licence, this library is in the public domain. The final step is to connect your Arduino Yun to the computer and upload the code, this project requires an Arduino Yun to work, with slight code modifications, it is possible to run this project on any microcontroller that has built in WiFi or you could attach a WiFi module to an Arduino device. Note that mobile data is required for the project to work on the move. This is a project that I wanted to implement for a long time, it has a basic idea behind it, when the user approaches the House, the lights in the house turns on, I have not connected this project to my house's lights but have used an LED instead of a that, if you wish to connect this project to your home's lights, you can add a relay and connect it to the same pin on the Arduino as the LED and also connect it to the wires connecting your lights to power, but first, test the project to make sure that the wiring is correct and the project works. Good Luck.